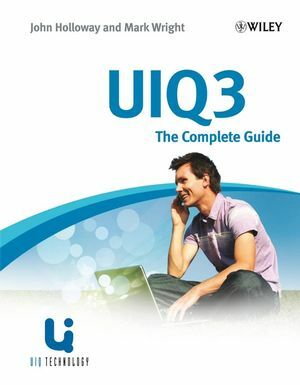 UIQ3 is a major tool to help programmers grasp the new features in UIQ3, and also to explain and simplify the processes necessary when porting from UIQ2 to UIQ3, and from other platforms. After a brief introduction and history of UIQ, the book explains the key new features of UIQ3. The SDK is introduced and the reader is taken from a simple 'Hello World' program through the application components of UIQ using helpful examples. Additional functionality such as Comms is covered as well as optimisation, deployment and signing. The book progresses on to portray porting, covering UIQ2, Series 60, Windows Mobile and Palm OS. Necessary steps will be explained and examples used to provide a worked example from each source environment. UIQ3 provides a single comprehensive resource, which will enable programmers to get up to speed and working on the platform quickly. Mark Wright (editor) joined Ericsson in 1997 and took a key role in defining the functional and user interface specifications for "Communicator" class products. When Symbian was formed, Mark was seconded to the 'Quartz' team as Project Manager and managed the functional specification and definition of the GUI. Mark has extensive experience in communicating between different teams, notably Marketing and Development. He has provided third party support and written detailed White Papers for the Sony Ericsson P800 smartphone and Sony Ericsson's range of 2G, 3G and WLANPC Cards. John Holloway is the CEO of ZingMagic Limited, a mobile games developer and publisher, and the Director of Client Software Applications at Mobrio Ltd, an online social networking and user generated content services company. John is one of the most experienced mobile software architects in the world, with over 22 years in the arena. John commenced his career with a ten-year spell at Psion where he contributed significantly to the body of software code that now lies at the heart of Symbian OS. He was the founder of Purple Software and his role as CTO culminated in the company being awarded the first ever BAFTA for a mobile computer game in 2002. Matthew Hunt joined Sony Ericsson in and worked to establish and build the Enterprise & Partner Support Team, which is responsible for providing Sony Ericsson, Symbian and UIQ technical and development support to software suppliers who are delivering software or services for Sony Ericsson Smartphones. Simon Judge is a freelance Mobile Developer and has worked in mobile for over 11 years and IT for over 20 years. After working at Vodafone and Oracle, Simon has been responsible for many Symbian projects for companies including Pixology, Boots, Jessops and Philips Research. More recently Sony Ericsson commissioned Simon to write UIQ tutorials for Sony Ericsson Developer World. He has also worked at Symbian in the Java team.